Shaped Happy Birthday Greeting Cards - Birthday Fun Cards You Can Make. Shaped birthday greeting cards are really birthday fun cards to make. If you re tired of making the standard rectangular or square shaped greeting cards, then start making some shaped birthday cards instead. Maybe these card ideas might be able to inspire you to make some shaped birthday greeting cards that will surprise the recipients of your handmade birthday cards. Try other shapes too. Maybe, you can add more shape ideas to this list. Have fun! Here's a shaped birthday card I have created. 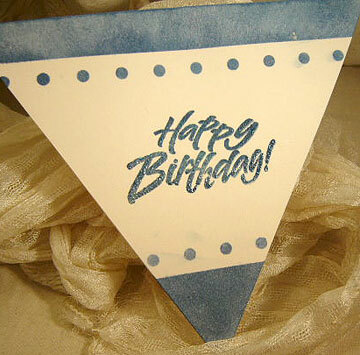 It's just a quick and simple triangle shaped birthday card but it's quite a cool card to send to someone in a hurry. I think the shape is the element that makes it a bit more special. Below are the items needed to make this triangle birthday card followed by the step-by-step instructions. Off white color cardstock 10" x 5.5"
Place triangle shape template on the folded card..
To download the template, just click on the link above and right-click to save to your computer. Draw the outline lighty with a pencil. Cut the outline of the triangle shape on your folded card. Place the computer paper with the holes edge on the folded card. Tape down with the cellophane tape. Stick the tape onto a piece of clean cloth 2 or 3 times to make it not so stickable. Sponge and blend in the navy ink onto the holes area and outside the edge. Do the same for the bottom triangle area. Ink Happy Birthday rubber stamp with navy blue color ink. Stamp the image on the centre of the card. Pour clear embossing powder on the stamped birthday greetings. Shake off excess powder and use a small brush to brush off stray powder. Heat with the heat gun. Note: Check out more Birthday Cards on my Oh Happy Birthday website. Cool! 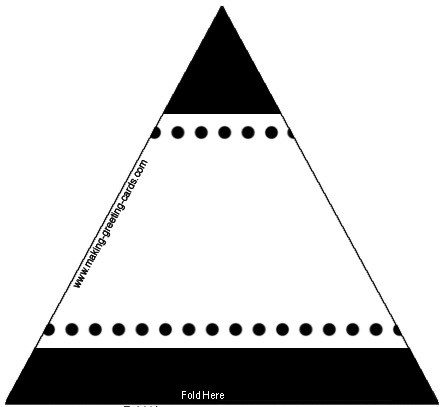 For the envelope, you can make your own triangle shaped envelope to put in the card. Or if you don't want to go to so much trouble since you are in a hurry, then just use a store bought square envelope.